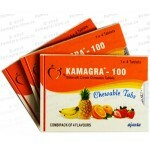 Kamagra (Sildenafil Citrate 100mg) Chewable Soft Tabs. The Kamagra Soft Chewable Tablets 100mg is the first Sildenafil Citrate Tablet in a Chewable form ever made. Kamagra Soft has advantage over the Kamagra pills due to its Soft form which dissolves quicker, So it starts to work faster as they get into blood stream in short time. STRAWBERRY / ORANGE / BANANA / PINEAPPLE. How do I take Kamagra Soft 100mg? Alpha blocker drugs: Erythromycin, Mibefradil, Nitroprusside, Nitrate containing drugs, Seizure drugs, Medications used for treating heart disorders. We can’t ship To Norway, USA, Canada, Australia due to these countries regulations on these drugs, unfortunately we will have to cancel and refund your order if ordering from these Countries.